"As a good Capricorn, I have always had a great affinity with Saturn, my ruling planet. Its existence has always given me much curiosity and at the same time a lot of inner peace. Saturn is among the most majestic creatures of the firmament, dressed in its golden tones and sheltered behind a series of perfect rings, made literally from cosmic rocks and stardust. How could one not be curious about it? Finally, someone has taken up the task of recording and supplementing the scarce astrological information previously available about Saturn and delivered it properly broken down and organized in a way that is easy to understand and apply day by day. 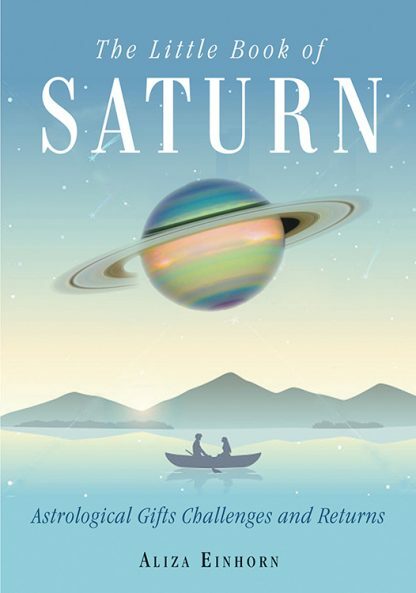 Finally, Aliza Einhorn�s The Little Book of Saturn offers the substantial information I have long sought. The Little Book of Saturn, a smart, friendly introduction to the astrological Saturn, is a book for curious readers who know there is more to astrology than their sun signs. Saturn has traditionally been considered the planet of challenges, but the life lessons that this stern planet brings are necessary for personal growth. This book is suitable for beginners and experts alike. It discusses the influence of Saturn on the natal horoscope, focusing on Saturn in its various places in the birth chart and exploring the various transits, especially the return(s), which brings with it a period of transition that is often feared, but Aliza Einhorn shows you how to understand and navigate them with confidence. Aliza Einhorn, astrologer, tarot card reader, poet, and playwright, holds an MFA from the Iowa Writers� Workshop. She blogs at her website, "MoonPluto Astrology," and does readings (astrology and tarot together) professionally. She also teaches metaphysical classes online and runs chat rooms for the metaphysically minded. A former New Yorker, Einhorn now resides in Florida.